Northern Michigan is a popular summertime destination, but our recent visit to Ludington in northern Michigan reaffirmed our affection for the idea of heading north for a little wintertime R&R at a B&B as well. 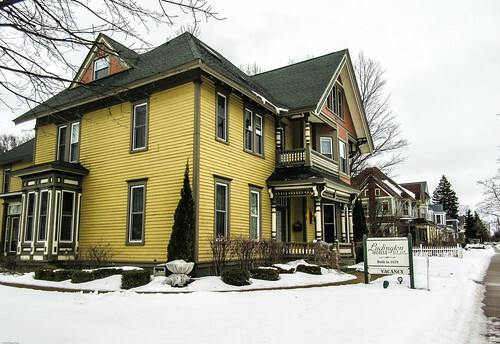 I spotted a special deal online for an off-season stay at The Ludington House, and it didn't take long for me to decide that this was the place I wanted to go for my late-January birthday. We've visited Ludington in the past (most notably to take a 3-mile round wintertime trip hike through Ludington State Park to see the Big Sable Point Light), but we never stayed overnight in town until this most recent trip. Bob and Ellen Alderink took over as innkeepers at this B&B housed in a 1878 Victorian home in summer of 2014, but the warmth and enthusiasm the duo showed for their role as innkeepers and caretakers of the home's rich history made us feel immediately at home when we arrived for our short stay. Lumber baron Antoine Cartier built the three-story Queen Anne-style house as a home for himself, his wife, Eliza and their children. Cartier came to Ludington after moving from his childhood home and life as a farmer in Quebec during 1852. He spent a couple of years in Chicago and then Manistee, Michigan learning the logging business. Fur trappers and shingle-makers first came to area during the 1830s and 1840s. Burr Caswell and his family became the first permanent white settlers in this in 1847 and the village then named for the Pere Marquette River. Milwaukee businessman James Ludington became involved with the area when he loaned money to a man who wished to purchase a sawmill. Ludington ended up with the sawmill when the man defaulted on the loan. Much of the land that Ludington gained at that time ended up becoming the town of Ludington. The village of Pere Marquette earned its charter as a city in 1873, and Ludington offered to donate $5,000.00 to the city on the condition that it bear his name. Ludington Avenue, James Street and several other streets in town bear the names of Ludington and his family members. Ludington, the city, experienced a boom during the late 1800s because of its sawmills, the discovery of salt deposits in the area and the logging industry that drove it to become a major Great Lakes shipping port. Cartier, meanwhile, came to the city after becoming a logger driving and directing logs down the Manistee River and beginning work on the Pere Marquette River during the mid-1850s. The lumbering industry continued to grow in the area, leading to the establishment of railroads to begin shipping lumber across the state and a ferry service that began moving cargo and passengers across Lake Michigan during the 1890s. Cartier became a U.S. citizen in 1870, the first in his family line to do so (a line traced back to explorer Jacques Cartier who claimed Canada for France). Cartier sunk his roots deep in the area after marrying his wife Eliza in Manistee in 1859 and subsequently moving to Ludington. He built a grand home for his family at the northeast corner of Ludington Ave. and Lavinia Street in 1878. Cartier served as a member of the city council for four years in Manistee, so it was no surprise when he became active in local politics and served as mayor of Ludington during 1880 and 1881. Even as the city's fortunes grew during those decades, changes in the lumber and transportation industries saw the waning of the city's star as the forests and ferry fleet shrunk leaving the city to rely more on tourism and a fleet that became a one-boat show by the mid-1900s with the SS Badger doing the Lake Michigan crossings. 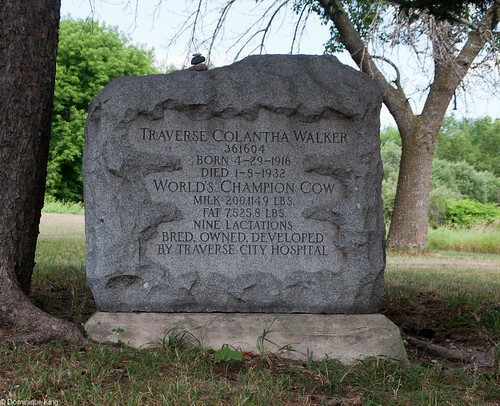 Cartier died in 1910 and rests in the city's Pere Marquette Cemetery. His grand home lives on to welcome guests just a short walk (in warmer weather!) from Lake Michigan and downtown Ludington. The Alderinks share the story of Cartier and his family with books and photos throughout the house, including reproductions of portraits of Antoine and Eliza in the parlor painted by Italian artist Luigi Gregori in 1884. We also enjoyed the home's vintage architectural features and decor details like herringbone-patterned hardwood floors, carved cherry and oak woodwork, 12-foot ceilings, a walnut staircase and stained glass windows. 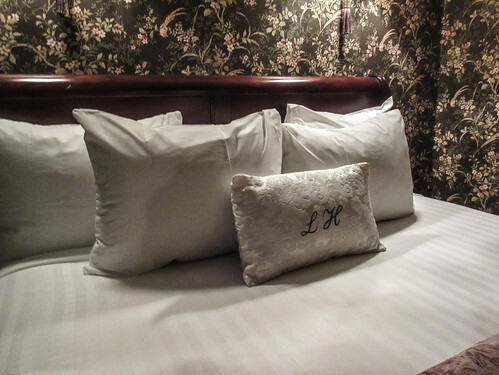 Each of the Ludington House's eight guest rooms have private baths and comfy queen-size beds. 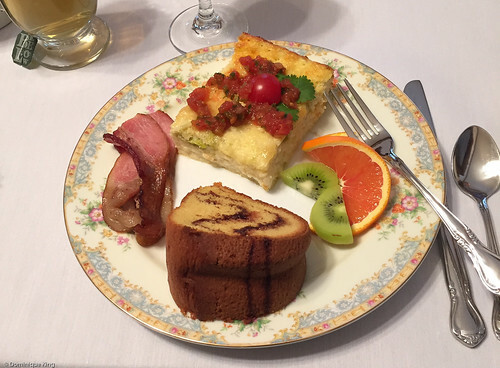 We loved starting the day with a full breakfast at The Ludington House, and the Alderinks proved the prefect hosts as they advised us about Ludington's history and some of their favorite places in town to enjoy dinner. 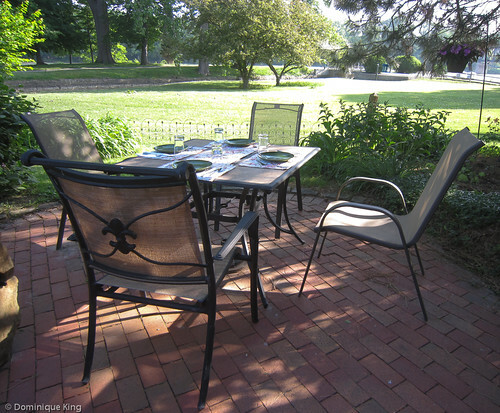 The Ludington House is part of the Bed and Breakfast.com network. Learn more about it more here. Want to know where we enjoyed our evening meals in Ludington? 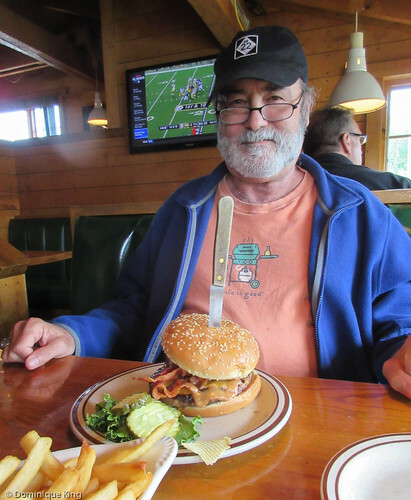 Check out my story Eats in Ludington, Michigan. 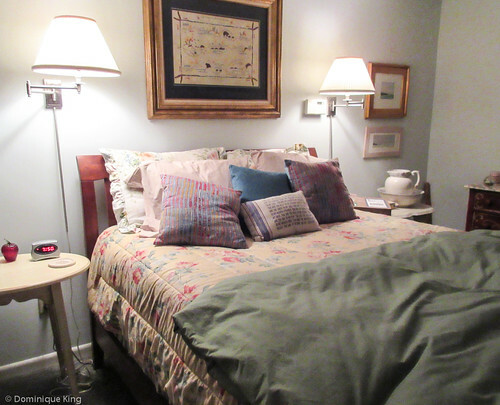 We recently revisited the Inn at Honey Run in Ohio's Amish Country and found our getaway at the inn every bit as lovely and as relaxing as I remember it being during our last visit five years ago. The biggest things you'll need to take on this trip are hearty appetites and a cooler to take some of the goodies you find home with you. We loved relaxing at the inn and exploring the small towns populating the area like Millersburg, Charm, Trail and Berlin, and as big cheese lovers, we especially enjoyed visiting the local cheese factories and markets to sample and stock up on some of our favorites like Amish Butter Cheese and Trail Bologna. I scored a "once in a blue moon" discount deal by following the inn's email newsletter, jumping on the opportunity to book a short fall getaway earlier this summer on the occasion of July's "blue moon". We'd hoped to book closer to the height of fall color season, but as our early November weekend at the inn arrived, we had perfect temperatures that hit the low 70s during the day and mostly stayed above 50 each evening. 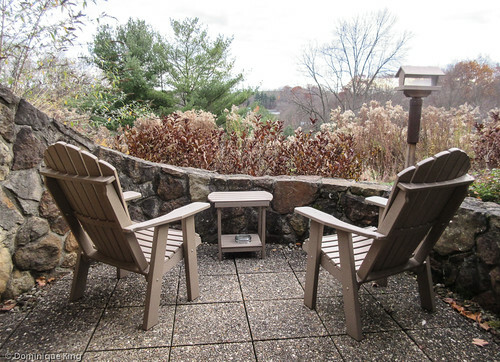 That weather made it perfect for hiking some of the inn's short trails, having a glass of wine on the outdoor deck at the inn's main lodge and exploring the area. The trees still had a bit of color, and it was pleasant enough to enjoy sitting out on our outdoor patio in the inn's Honeycombs unit, a unique building set into the earth overlooking the inn's meadow and farmland. We found birds particularly plentiful when we last visited the inn during the spring, but we found plenty of birds to watch here in early November, including a large cardinal that seemed particularly fond of the bird feeder right by our patio and a beautiful woodpecker which we enjoyed watching as he perched on a tree by the plate glass windows in the Tarragon dining room during breakfast one day..
We remembered the food as being excellent at the inn when we last visited, but we were especially excited to try Tarragon this year as a new chef and menu came to the Inn at Honey Run just after our last visit. The meals were elegant, if a little on the pricey side, and the service was particularly attentive and friendly. Another change since we last visited was the fact that the inn extended Wi-Fi access (previously only available in the main lodge) to rooms in the Honeycombs building. Among the things that remained unchanged was the beautiful view of the stars that we enjoyed while sitting on our patio and hearing the occasional "baaa" from the inn's barn sheep or "clip-clop" of horses drawing Amish buggies along the road near the inn. 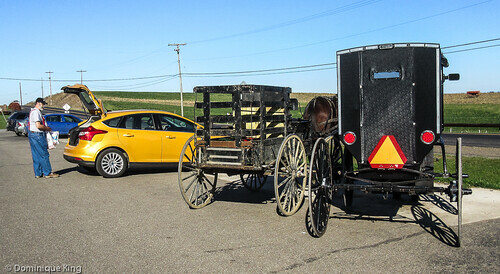 It's worth noting that drivers should exercise caution while driving along the hilly and curvy roads in Amish Country and keep especially alert to spot slow moving buggies along the highway. Check our story Driving in Amish Country to read about our encounter with one driver's impatience and a tragedy averted by one young woman's excellent horsemanship. 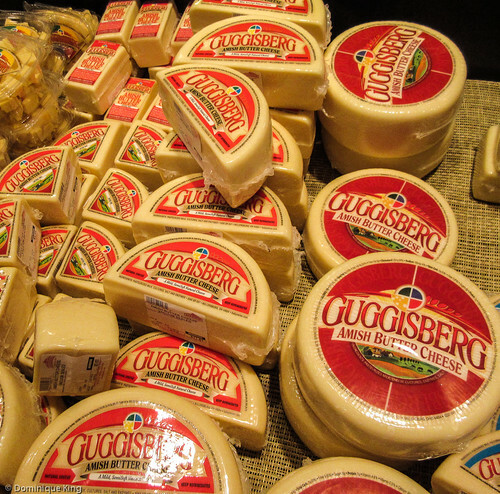 Amish Country is a foodie paradise, especially for cheese lovers, and we enjoyed revisiting the cheese stores and factories at Guggisberg and Heini's Cheese Chalet where you can sample favorites like Ohio-made Amish butter cheese or Swiss cheese. We also liked Troyer's Market, where we parked beside the Amish buggies in the parking lot on a shopping trip for bulk foods and the company's famed trail bologna, plus I stopped at Swissters in Sugarcreek (formerly Heini's Gourmet Market) where I could pick up a couple of bottles of my favorite Ohio Riesling to take home. A day of shopping for cheese, bologna and wine left us hungry for some authentic Amish dinner fare. Checking in with Yelp on my cell phone app (which is usually pretty good about helping us find great local grub) led us to Mrs. Yoder's Kitchen. Yelpers raved about the broasted chicken at this restaurant, and we both had to agree with that assessment. We opted for the chicken dinner with the classic Amish noodles and a trip to the salad bar. We both like broasted chicken and found Mrs. Yoder's version to be particularly tasty, meaty and juicy. The restaurant, owned by Gloria Yoder, who started the restaurant about 15 years ago, is a favorite stop for locals and tourists alike. Click on Visit the Inn at Honey Run in Ohio's Amish County and Amish Cheese and more in Holmes County, Ohio for more about our previous visit to Holmes County. Empire always struck me as the quintessential northern Michigan community and, as home to the Sleeping Bear National Lakeshore's headquarters, it holds a pretty special place in our hearts. The combination of hometown hospitality, beautiful scenery and a laid-back atmosphere makes it a great choice for a relaxing trip any time of the year. 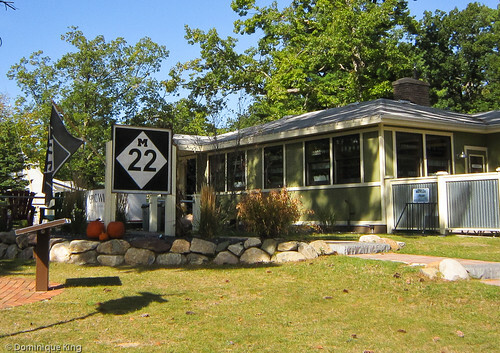 Here are a few of our favorite spots along Highway M-22 in Empire and the immediate area. Empire is just 25 miles from busy Traverse City, but the serene and relaxed atmosphere you find here makes it seem like it's a world away from the busy big city. Empire has a wide sand beach at its village park along Lake Michigan with a spectacular view of Empire Bluffs and Sleeping Bear Dunes. It's a great place to stop to see a sunset, watch folks flying kites or to enjoy a swim. The area's summertime popularity has, unfortunately, resulted in Empire having to introduce a small charge for parking at the beach, although sneaking in a short visit to take photos without paying for parking is quite possible during the quieter months. Empire also hosts a couple of fun and quirky events like the annual Asparagus Festival in May and the Dunegrass Festival each summer featuring a bill of folk and bluegrass music. Want to learn a little more about Empire's history as a lumbering town? Check out the historical marker about the Empire Lumber Company at the beach. 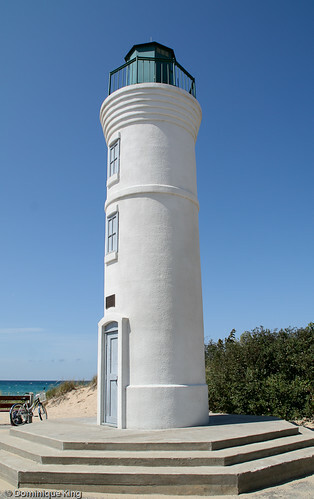 Also be sure to check out the Manning Memorial Lighthouse at the beach. The 35-foot tall structure is a small-scale, but fully functioning, light tower that is one of only three memorial lighthouses in Michigan (the other two are in Detroit). Need help plotting your explorations around the Sleeping Bear National Lakeshore? Make sure you stop by the park's Philip A. Hart Visitor Center just off of Empire's Main Street. You can get your National Park passes, brochures and maps about park trails, information about park events, see a display about the park's history and natural resources, shop at the gift shop or find a nice, clean public restroom. We love driving down Wilco Road, a short stretch of winding road that snakes down the hill coming out of Empire and empties back on to M-22. This story also allowed me to yet again learn something new from my readers when a former airman stationed in Empire for a couple of years as a young man stopped by Midwest Guest a couple of years after I originally wrote the story and confirmed my conjecture about the origin of the road's name (it comes from radio slang that basically means "message received, will comply"). 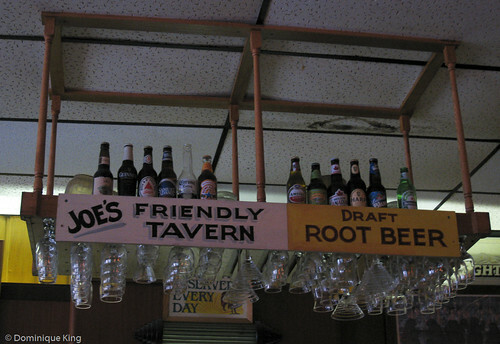 Stop by Joe's Friendly Tavern for the quintessential bar burger and brew (either beer or draft root beer!). Tim has memories of eating breakfast here with his family after they attended church in Empire, and this is still a regular stop for us when we're in town. We stayed at a lovely bed and breakfast inn a few miles down the road from town when we lasted visited Empire two months ago. 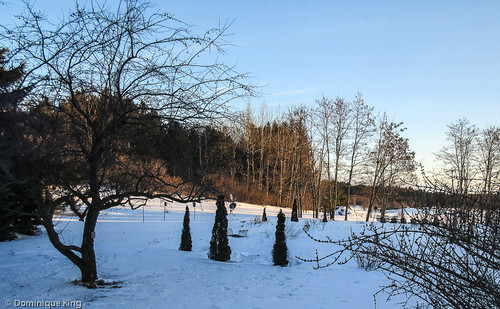 We drove through the beginnings of a snowstorm as we arrived at The Sleeping Bear B&B that winter night, but the cozy inn and grounds resembled, as Tim said that night, a picture postcard...provided the perfect ending to yet another favorite road trip to M-22. Be sure to also check out Parts 1, 2 and 3 of this road trip series about Michigan's Highway M-22. One of our favorite styles of stays when we're on the road is a bed-and-breakfast inn, and our recent stay at the Sleeping Bear Bed and Breakfast in Empire, Michigan perfectly fit the bill as a beautifully serene post-holiday getaway in the area named the "Most Beautiful Place in America" by tens of thousands of viewers of ABC's the popular "Good Morning America" in 2011. Susan and Van Wilson welcome guests year round to their home in a rambling late-nineteenth-century farmhouse on four rolling acres of farmland just a few miles down the road from the main visitors' center for the Sleeping Bear Dunes National Lakeshore and just a short drive from Glen Arbor, Michigan, which is home to the Michigan cherry goodness that is the Cherry Republic. 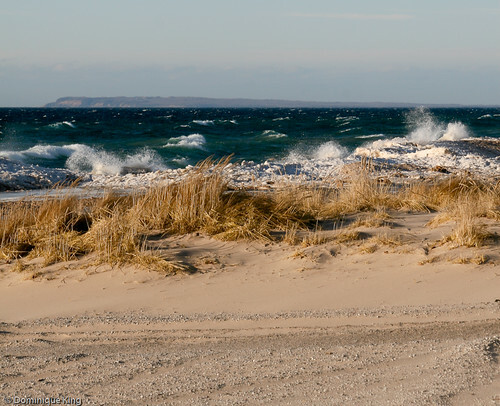 Many of our other favorite northern Michigan destinations are also within a half-hour drive of the inn...places like Leland, Glen Haven, Sutton's Bay, Interlochen, Benzonia and Traverse City. 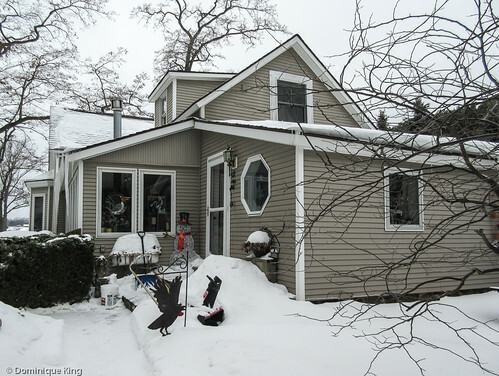 We headed on up to the Sleeping Bear B&B on a cold February day, arriving just as what would become an overnight six-inch snowfall arrived in this area of northwestern Michigan, but we found a warm welcome when we arrived at the inn. Tim's reaction as we walked through the inn's yard from our car? "This looks just like a postcard!" Susan even brewed ice tea especially for me! The next morning, we enjoyed pumpkin waffles before heading back out to our car, which we found Van had thoughtfully cleared of the freshly fallen snow. 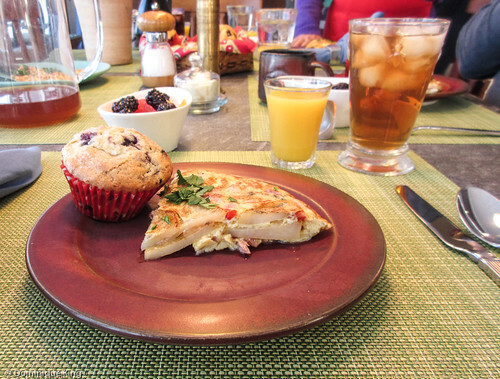 We stayed at the Sleeping Bear B&B eight days, and Susan served up a different breakfast each morning. We started each day with things like the pumpkin waffles, omelets, a tasty egg bake featuring roasted red peppers, berry smoothies, scrambled eggs featuring Feta cheese with a side of locally produced bacon, a lactose-free puff pancake and more. Special diets are no problem. 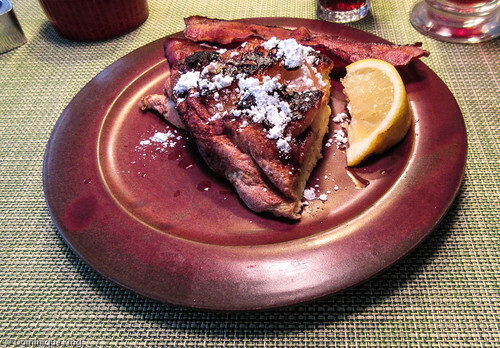 Susan comes up with meals to suit dietary restrictions that taste great, like the puff pancake recipe she perfected for a guest who was extremely lactose-intolerant to gluten-free meals that had another online reviewer raving about her meals on Yelp. Just be sure you give her at least 48-hour notice if you require a special diet, or let the Wilsons know of your special dietary needs as you make your room reservations. Susan worked as a pension actuary for 30-plus years. She also studied cooking to become a great chef along the way to becoming an innkeeper while Van has a background as a former art teacher and skilled construction craftsman. While Susan expresses her artistry in the kitchen, you can check out samples of Van's artwork throughout the inn that include some of his large sculptures and totems that feature black birds and other Native American-style motifs. 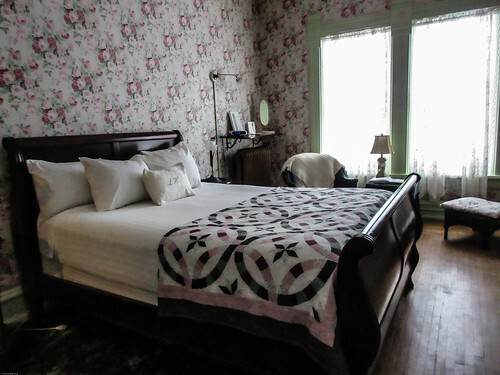 The inn has five rooms, and we stayed in the Sleeping Bear room, which is a large first-floor room that formerly served as a parlor with a comfortable queen-sized sleigh bed. 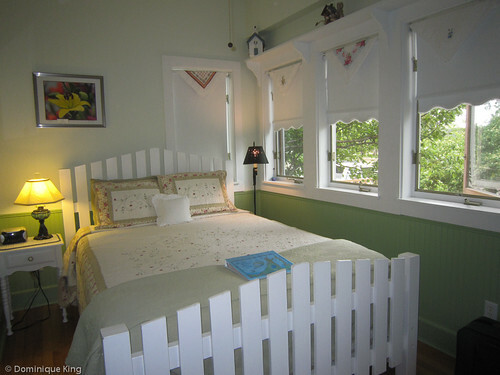 The home became a B&B in the early 1990s, with Susan and Van moving from the Chicago area to Empire and acquiring the B&B in 2002. The duo enjoys sailing and kayaking and are ever-ready with suggestions about places to explore and great places to eat when it comes to dinner in the area. We had a lot of fun talking with Susan (who originally hails from Ohio) and Van (a native of Texas) during our stay, and loved the fact that because it was such a quiet week, we saw a lot of their two dogs during our week at the Sleeping Bear. 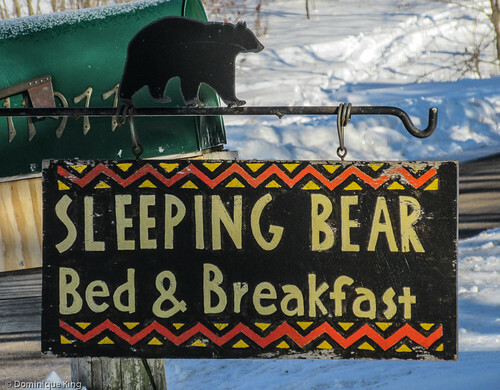 Check out the Sleeping Bear Bed and Breakfast Web site to find out more about the inn or to book your own stay! 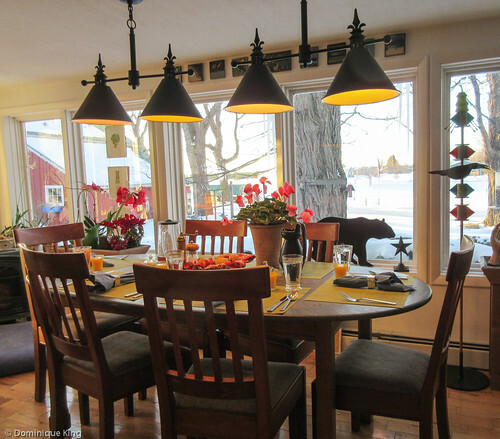 We love staying at a bed-and-breakfast inn where we can relax, enjoy a few good meals, see something new and return home from a short getaway feeling renewed and refreshed. 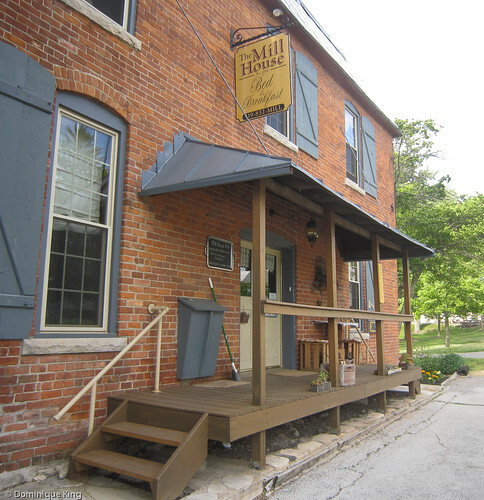 A long drive home can sometimes erase a little of that chill vibe before you have much of a chance to enjoy it, so I was thrilled to find The Mill House, a relaxing bed-and-breakfast inn just a short drive over the Michigan-Ohio border in Grand Rapids, Ohio. Grand Rapids is an historic canal town about a half-hour drive southwest of Toledo, Ohio, on the southern shore of the Maumee River. Our habit of taking the back roads and dawdling on our way home from a trip whenever is to thank for the discovery of this small-town inn as we spotted it while trying to follow the old roads along the Maumee River home from a trip to western Ohio last year. One of the things that caught my eye at that time was old steam-powered mill built in the late 1800s that now houses The Mill House Bed and Breakfast. I made a mental note to return to The Mill House for a later stay, which we did earlier this summer. We don't have a lot in the way of canal history here in Michigan because we were north of the main routes west, so Ohio's rich canal history and its important role in this country's westward expansion always fascinates me. The Mill House's location on the main route through town and along a piece of the Miami and Erie Canal proved to be the perfect place to experience a bit of canal history up close and personal. Staying at The Mill House is a special treat for history buffs. The inn is in a restored flour mill, originally built in 1898 from locally quarried stone and bricks from the local brickyard. 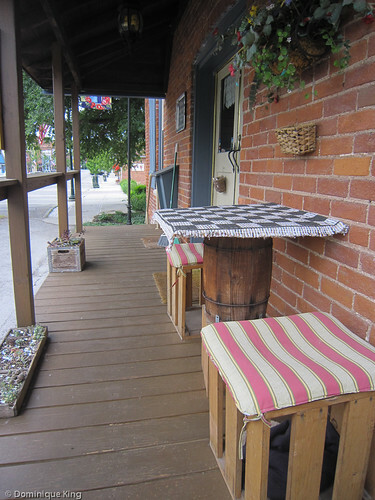 The inn takes full advantage of the exposed brick walls and old wooden beams to create a cozy atmosphere for guests. The Phoenix Mill served local farmers who brought their wheat in horse-drawn wagons and trailer-drawing automobiles for many years, leaving with Stump's Best Flour or feed for their livestock. Once the mill closed later in the twentieth century, the building served as a tavern for a short time and experienced some unfortunate reworking into an apartment building. By 1992, the building's role as a working mill was long over and it finally assumed its new role as a bed-and-breakfast inn. 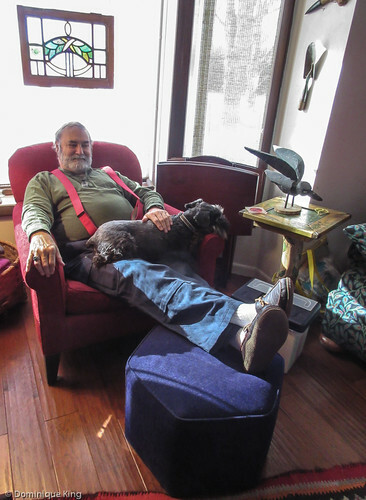 Ron and Kathy Munk became the owners/innkeepers in 2006, further renovating the inn and creating a refuge from the big city that is close enough for us to drop down for an overnight stay or a quick getaway for a day or two. 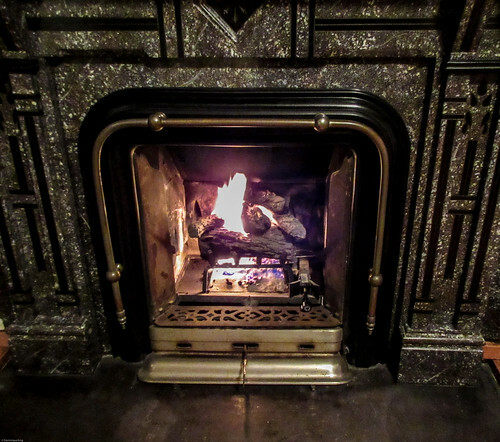 The inn has four first-floor rooms with private baths and many modern amenities like good, strong Wi-Fi, flat-screen televisions, DVD players and air conditioning. A small common room has a snack station with hot and cold beverages and baked goods on hand throughout the day. Kathy learned that I'm a big ice tea drinker and even made sure I had a constant supply of my beloved ice tea on hand throughout our two-day stay. Kathy is also a great cook, providing guests with a full breakfast each morning and adjusting her recipes to produce tasty gluten-free or lactose-free meals for those who have dietary restrictions. Breakfast is in the common room or, if the weather is nice as it was during our stay, on the riverside patio surrounded by a native perennial garden. Ron and Kathy learned of our interest in the area's history and quirky sites and readily suggested several sites and things to do that we never have found on our own. Kathy suggested walking down the towpath trail at sunset behind the inn. It is only a half-mile walk to Thurston State Park along the trail from The Mill House, and it's a great way to watch the sunset over the Maumee River, which the state of Ohio named as a State Scenic River. Look for some more stories in coming weeks about some of the places we explored in the area. Want to learn more about the Miami and Erie Canal history? Check out the upcoming Miami and Erie Canal (Images of America) by Bill Oeters and Nancy Gulick. We don't have a lot of canals or canal history here in Michigan, so I especially enjoy the opportunity to learn about this history of these important late-nineteenth-century transportation arteries in other parts of the Midwest and their importance in the westward expansion of the United States. Our recent visit to the historic canal town of Grand Rapids, Ohio was a chance to visit some historic canal sites and, more importantly, to relax at a beautiful little Bed and Breakfast inn we discovered along the Maumee River. 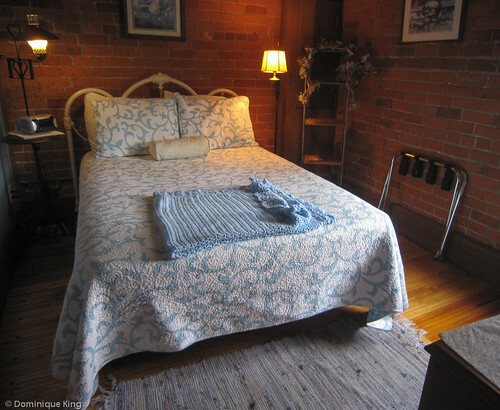 Better yet, Ohio's Grand Rapids and The Mill House Bed and Breakfast is only about a half-hour drive southwest of Toledo, making it perfect for a quick getaway for us from the Detroit area! Check it out by reading my latest story at the Ohio Tourism Division's Discovering Ohio blog, Experience historic Grand Rapids, Ohio. There are plenty of glorious views of Les Cheneaux Islands from land, but the best way to get a good look at the 36-island archipelago in the extreme eastern portion of Michigan's Upper Peninsula is on the water. 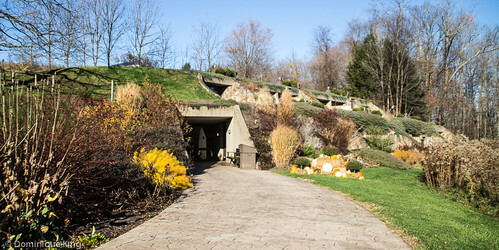 We stayed at Dancing Waters, a small bed-and-breakfast on the tip of an island offering a 270-degree view of the chain of islands. That view was pretty glorious in and of itself, but we didn't have kayaks and the inn's pontoon boat was in for repairs. Here was where the true value of staying at a B&B run by locals came into play, as our host recruited one of his friends with a sailboat to take us out for a couple of hours to tour the islands from the water! Boating at Les Cheneaux has a pretty long history, dating back at least 400 years when Native Americans used dugout and birch bark canoes to get around the area, and French and British explorers did the same in canoes and a larger type of open wooden sailboat called a Mackinaw boat. People could drive into the area once M-134 started to develop in the Upper Peninsula by 1939, although the road wouldn't go all the way through to Drummond Island until the late 1980s. Still, boating is extremely popular in this area with plentiful natural harbors and sheltered channels during the summer. 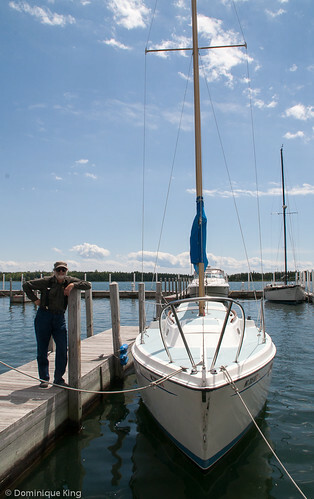 There is a major Antique Wooden Boat Show at Hessel in August, a renowned boat building school and many competitive sailing regattas during the summer. We were here too early in the year for a lot of these activities and limited early-season hours meant we didn't catch Les Cheneaux Historical and Maritime Museums open during our early-June stay in Cedarville. 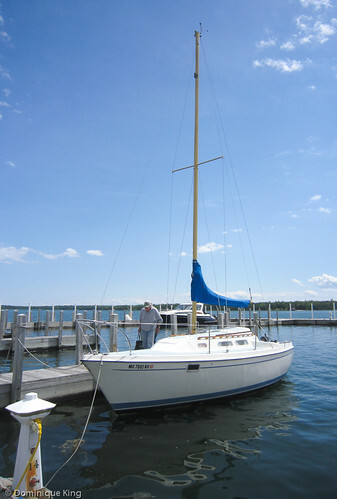 Still, we had a beautiful sunny day for our sailing adventure and a day free of crowds of other sailors. Our sailboat captain even allowed Tim to steer for a few minutes! 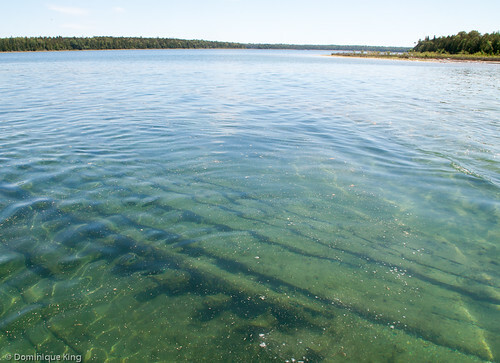 The water was clear enough that we could see the remains of several shipwrecks as we slowly sailed through some of the shallowest portions of the channels. We also saw a lone block house sitting on one of the larger islands. I failed to find much information about this curiosity. One touring site says the block house dates from the late 1800s, although I think it dates from considerably later or was extensively reworked in more recent years. I found an image of a considerably more battered version of this structure with a chimney that the photographer says sits on Long Island and a conversation on a boating forum that mentions the replacement of an older version of the block house in late 2008. 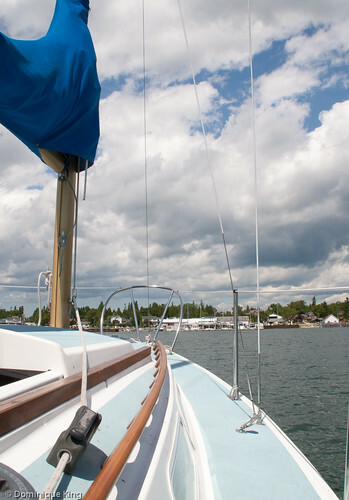 The trip was over all too soon, and we headed back into the marina at Hessel. 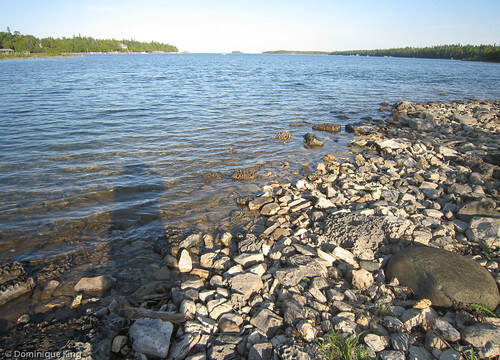 Want to learn more about Les Cheneaux Islands and the area's history? 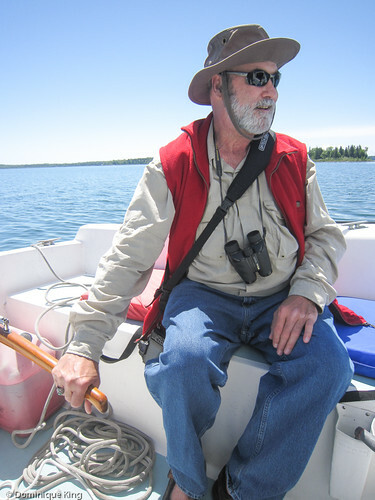 Check out Hessel, Cedarville and the Les Cheneaux Islands by Deborah I. Gouin, The Les Cheneaux Chronicles: Anatomy of a Community by Phillip McM Pittman, or A Brief History of les Cheneaux Islands, Some New Chapters, of Mackinac History by Frank R. Grover.